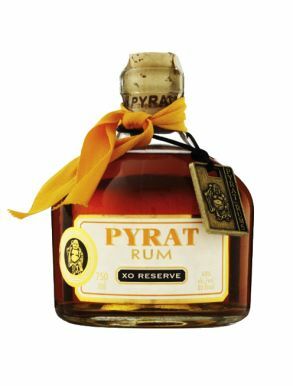 Pyrat Rum is know as the Enlightened Ultra Premium Dark Rum. Select Caribbean rums aged up to 15 years in American sweet oak barrels with hand crafted decanters fashioned after relic rum bottles once hoarded by pirates and ship captains in the 1800s. In tribute to the true Pyrat spirit of social enlightenment, each bottle is adorned with the image of Hoti, patron saint of protector of fortune teller and bartenders. Bottled in Guyana. Owned by Patron Spirits.